Tiptoe through the tulips to serenity. It was the first day of spring and a great day for a field trip, so I decided to heed the wisdom of the old adage…stop and smell the roses. I took the day off from my everyday duties of running my website (LAArtParty.com), and left the chaotic energy of Venice Beach — where I currently reside. One of my photographers, Richard Bilow, accompanied me on a day trip to Descanso Gardens in La Cañada Flintridge. It was a glorious day. The grounds are much larger than I anticipated. The one hundred and fifty-acre botanical park is broken down into beautifully curated sections such as the Rose Garden, Japanese Garden. Camellia Collection, Oak Forest, Ancient Forest, California Natives, Center Circle, Oak Woodland, and Nature’s Table. Alive with color and the fragrance of numerous blooms, Descanso is a treasure not to be missed. The moment I entered the park, I began to absorb all the beauty, and a calm came over me as I took it all in. I was immediately drawn to the blooming cherry trees which we were lucky to catch in their full glory. It was a perfect Spring day. A vast variety of flowers were in full bloom throughout the park. The Japanese Garden was particularly stunning. When I visited, the cherry and crab apple blossoms were in full bloom. However, the very next day a rainstorm arrived. Typically, these delicate blossoms fall to the ground when it rains since they are so fragile. 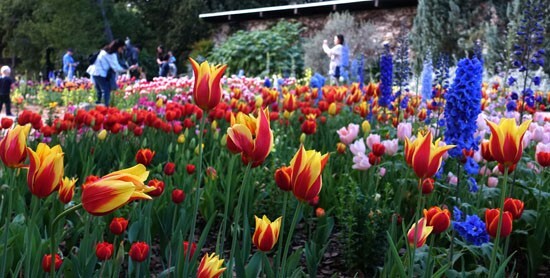 But don’t let that stop you…There are so many varieties of flowers currently blooming, it’s definitely worth the trip. When one bloom nears its end, another is just beginning. The Descanso Gardens was originally an oak forest, prior to being open to the public. The grandeur of these majestic trees serves as a beautiful backdrop…standing tall as if they were protectors…guarding the sanctity of this meditative respite. The camellias were one of my personal favorites, along with the clivia and wisteria, but the multitude and variety of tulips were a sight to see for sure. I practically had to drag my photographer away from the tulips as he worked to get the perfect shot. I did notice tracks to the Descanso Gardens Enchanted Railroad which the website points out. Although it is closed on Mondays (the day I visited), I can only imagine it would be a special treat for kids. There was also an on-site art gallery. So be sure to check the website for details. Visitors looking to view or photograph specific flowers in bloom are encouraged to call prior to arrival. The website also features helpful tips on when to plan a trip to catch that floral species on one’s must-see list. General Admission: $9; Seniors 65 and over/Students with ID: $6; Children (5 to 12 years): $4; Descanso members and children under 5 are free.